The box is packed with carefully curated items from a variety of indie brands & companies. All proceeds from sales are donated to the charitable organization chosen for the quarter. The very first box is launching Saturday and the proceeds will be donated to BCRF. BCRF donates 91 cents of every dollar towards breast cancer research and awareness programs. I've included descriptions/inspirations from each Artisan for their products and then added my comments afterward. Storybook Scents (Wax Clamshell) - "Sammie Anne" My grandmother is one of those people that when she walks in the room you feel like you're home. She is amazing, strong, beautiful, an entrepreneur, and the most loving person one could hope to meet. This tart is my take on her all-time favorite scent, Flowerbomb. Notes include marshmallow, vanilla, jasmine, freesia, & woody musk. Sammie Anne has been in remission from stage 3 breast cancer for about 10 years now, and I couldn’t admire her more for her bravery during that time. We love you Grammie! I'm unfamiliar with the Flowerbomb scent, but I think the wax melt smelled great! I used two cubes from the clamshell in my plate warmer and it was strong the first two days I melted it. After that, it gradually got more lightly scented. I enjoyed melting it and its bright pink color! First Sunday (Breast Cancer Awareness Keychain) - A beautiful embroidered keychain, lovingly donated by Jana Oglesby from First Sunday. Jana resides about 30 minutes from me, we've even met once in person to swap some wax and talk polish. She is a seamstress and sews up such creative cute items. The key chain is well made and durable and includes a snap in case you want to attach it to something different! Help raise awareness by rocking it on your keychain or back pack! 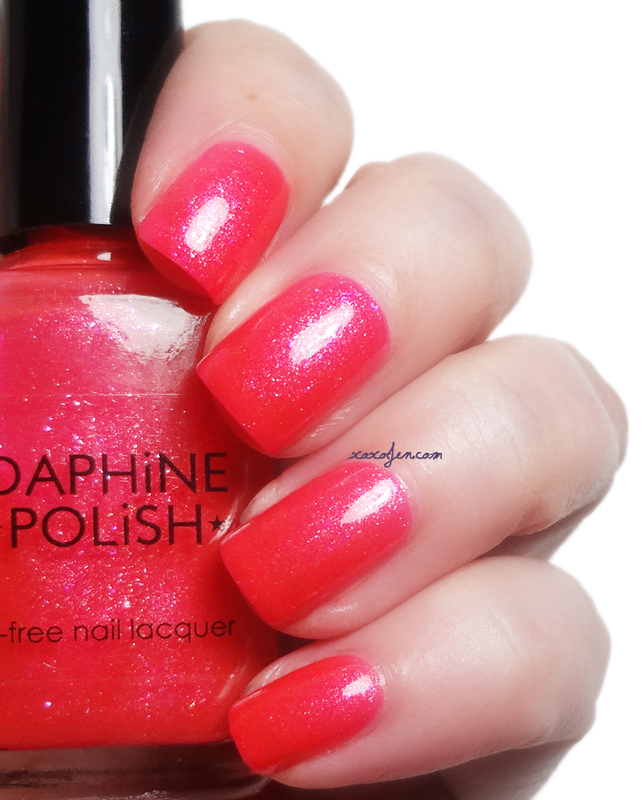 Daphine Polish (Nail Polish) - "Electric Rose" A neon rose pink packed with pink, peach, and gold micro shimmers. Two to three coats to opacity depending on nail length and application. This polish is dedicated to my mother, my aunts, and my grandmother, all strong Irish roses who were affected by breast cancer. 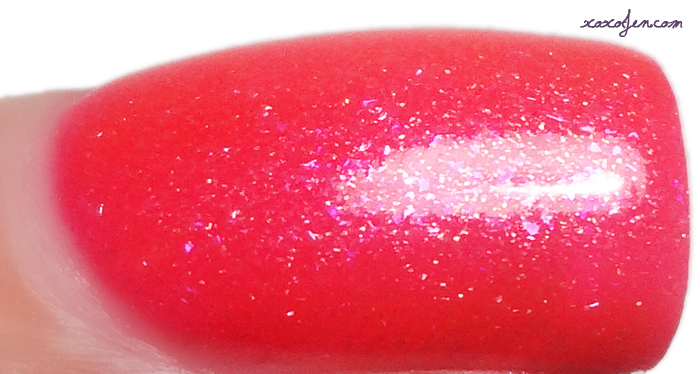 Pink and sparkly and such a great polish to help raise awareness for those around you! 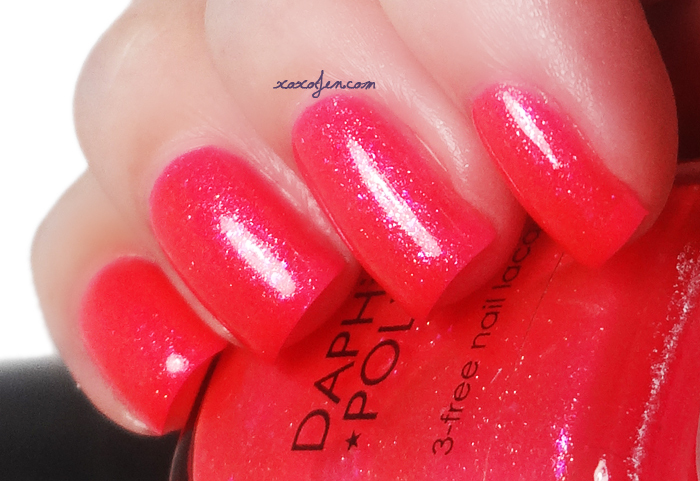 I wore three coats for the photos, the formula was smooth and easy to apply. Handmade Natural Beauty (Foaming Sugar Scrub) - "Almond Vanilla Berry,” my specialty Pink Ribbon scent dedicated to women everywhere to promote breast cancer awareness and support brave breast cancer survivors. Udder Joy (Goat Milk Soap) - "Bliss" I chose this fragrance as it's one of my mother's favorites. She is a survivor of breast cancer; it has been a long road, but after a double mastectomy, she has been cancer-free for two years. Bliss is a lovely blend of sweet cherry, toasted coconut, and crushed almond on a background of warm vanilla bean and creamed sugar. The foot balm is absolutely wonderful. I've used it on my cuticles, elbows and feet for a week and I can certainly feel a difference. It's a heavy balm, but it doesn't feel as greasy or oily as most of them do. It seems to absorb fairly quickly and it smells wonderful. The natural butter scents come through with a slight hint of peppermint. The sugar scrub is very scrubby and a little bit foamy. I tried it on my legs before shaving and they were smooth and soft as baby's cheek after! The bar soap feels so soft and the foam from it is slightly pink! 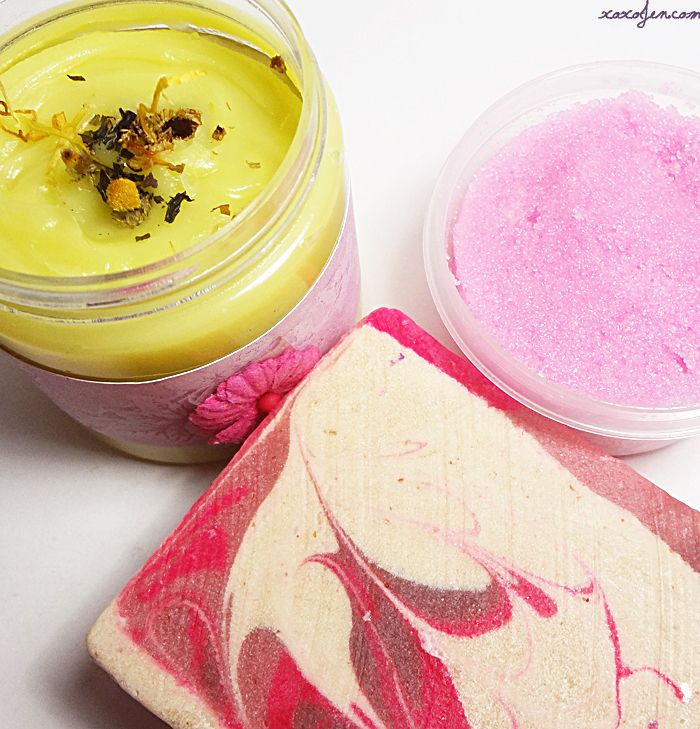 It leaves my skin feeling clean and the scent is soft and feminine. It goes really well with the scrub scent too! In addition to all the above items, a list of coupon codes from many other independent artisan businesses will be enclosed in each box. The box is launching Saturday October 24, at 11am Central time at the Storybook Scents online store. 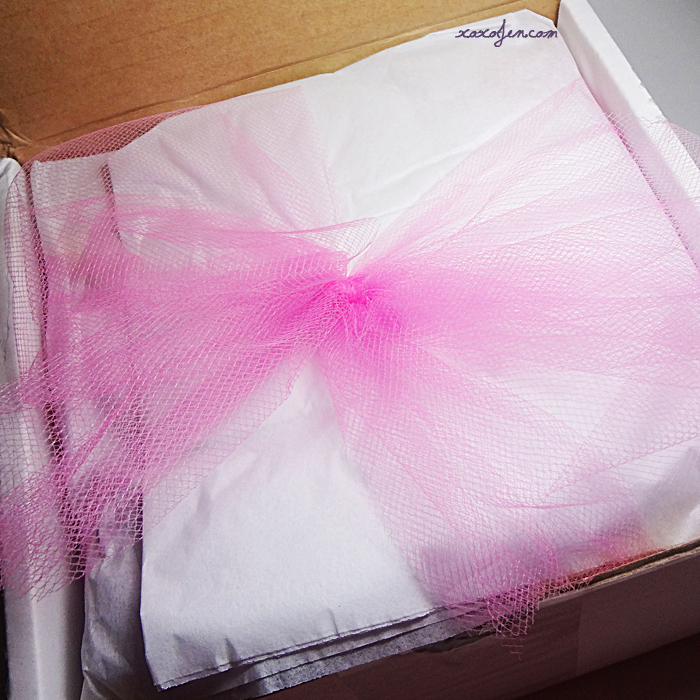 This box is packed with some lovely things for such a good cause too.